The Panasonic Lumix DMC-FX150 is a new digital compact camera with features that will appeal to both beginners and more experienced photographers alike. Panasonic's IA (Intelligent Auto) mode turns the FX150 into a reliable point-and-shoot that anyone in the family can use and achieve good results. More experienced photographers will be excited to learn that the FX150 offers a Simple Manual mode for changing the aperture and shutter-speed setting, plus a RAW image quality setting to help get the most out of your images. If you like to shoot movies with your still camera, the main attraction of the Panasonic FX150 will be the 720p, 16:9 ratio HD video mode, which can record 1280x720 pixel video at 30fps. There's also a whopping 14.7 megapixel resolution, currently the highest available on any compact, a 3.6x wide-angle Leica lens (28-100mm), 2.7-inch LCD screen and an all-metal body. 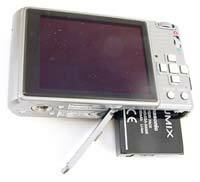 The Panasonic DMC-FX150 has an official list price of �299 / $399. Gavin Stoker finds out if the FX150 is the ultimate compact digicam. Panasonic's point and shoot Lumix compacts typically provide a safe haven for the uninitiated. This is chiefly thanks to the now standard iA (intelligent auto) mode automatically switching settings for the user dependant on the subject the camera is presented with (for example choosing 'macro' when presented with a flower), plus optical image stabilization (Mega O.I.S) on board to avoid blurred images when shooting handheld in dim lighting without flash � or at the telephoto end of the zoom. You could thus give a Lumix to your mother (or maiden aunt) and reasonably expect them to come back with evenly exposed and accurately focused images � if there's enough light to be had of course. Like the Lumix DMC-FX37 that we reviewed toward the end of last year (2008), the latest addition to the series in the slender build Panasonic Lumix DMC-FX150 feels solid and weighty in the palm thanks to a mainly metal construction. Though from the front it's again boringly box-y, the FX150's brushed metal top plate is an attractive styling that adds a dash of panache to the otherwise fairly sober metallic silver grey finish of our review sample. Still, it's fair to say most would-be purchasers will undoubtedly be dazzled as much by the thought of 14.7 effective megapixels crammed onto its CCD sensor � making it Panasonic's highest resolution model to date � as they will be by external looks. Thus the Panasonic Lumix DMC-FX150 joins a select club of svelte 13MP+ high resolution compacts that also includes the Canon Digital IXUS 980 IS, Sony Cyber-shot DSC-W300, Samsung NV100HD and the Nikon Coolpix S710. And, as with those cameras, the inevitable questions are raised: will the extra pixels result in additional image noise, will we actually be able to discern any difference between the FX150's images and those from a 10 or 12MP model, and do any of us truly need that kind of resolution from a snapshot model anyway? At an initial SRP of �299, Panasonic's high-res FX150 offering falls somewhere in the middle of the cameras we've just mentioned value-wise, though Amazon UK were offering it for a mere �199 at the time of writing � which even on initial impressions appears very fair indeed. Rather than just being another bog standard addition to the genre, the Panasonic Lumix DMC-FX150 features a couple of neat tricks missing from its competitors. For example, with ease of use in mind you get an 'E.Zoom' function that with a single press immediately propels the zoom through its range, stopping at maximum telephoto. That's if you find using the zoom lever that encircles the shutter button next to it too much of a strain. A further press of the E.Zoom button carries out a 7.7x digital crop of the image so that it appears the camera has zoomed in further, while a third press and the lens reverts back to maximum wideangle setting. As an aid to avoid missing that once-in-a-lifetime photo opportunity, it might just come in useful. Powered by the Venus Engine IV processor, more surprisingly perhaps the Panasonic Lumix DMC-FX150 also offers the ability to capture RAW files, usually the preserve of the photo enthusiast, either separately or in tandem with JPEGs; and this from an outwardly unassuming 'snapper' that can slip unobtrusively into your top pocket. A focal range that starts at a wide angle 28mm (up to a more standard issue 100mm equivalent in 35mm terms) is also very useful for landscape shots and group portraits. Also helping the Panasonic Lumix DMC-FX150 stand apart from the crowd is a colour bracketing function that lets the user record a full colour, black and white and sepia version of the same subject with a single shutter button press. Plus there's a widescreen HD movie mode too, boasting 1280x720p resolution clips at 24 frames per second, in addition to WVGA (848x480 pixels) and VGA (640x480 pixels) alternatives. Again, better than you'd expect. On specification alone then, the FX150 reads like (possibly) the compact to end all compacts � the only thing that could possibly be bettered up front being a broader focal range to really extend creative possibilities. 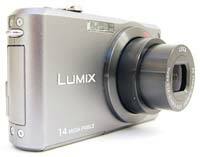 As we've indicated, the Panasonic Lumix DMC-FX150's boxy faceplate design is however sufficiently run-of-the-mill to fade back into the crowd (save for the class-leading 14MP figure indicated beneath the Lumix brand logo), but not so plain as to be unattractive. Maintaining the camera's must-have slender proportions, the Leica-branded zoom lens is internally stacked when the camera is inactive, the lens surround emblazoned with the fact that it comes optically image stabilised as standard � which is always welcome. Also adorning the austere front of the camera is a thin sliver of a window housing the integral flash, located top left of the lens and feeling slightly underpowered when left at its default setting, plus a second, smaller and rounder dual-purpose window for the built-in AF assist/self timer lamp. The top plate of the camera is similarly reserved, though what few controls there are, are set into an attractive brushed metal strip with rounded off edges. Working from left to right, if viewing the camera from the rear is a row of four dots signifying a built-in mono speaker, with a fifth separated 'dot' housing the Panasonic Lumix DMC-FX150's mono microphone. An on/off switch with ridged top for added/easier purchase comes next, and falls readily under the forefinger. Flick this to 'on' and the camera powers up in just over a second, lens extending to maximum wide angle setting plus rear 2.7-inch, 230k dot resolution LCD blinking into use for shot composition in the absence of an alternative of an optical viewfinder. Though the camera is quick to determine focus and exposure, a main AF point blinking green by way of confirmation (with 11 AF points to select from), go on to take the shot and, surprisingly, there's a slight yet noticeable shutter delay, which doesn't make it the ideal tool of choice for capturing the likes of children at play. In other ways however the FX150 is a consummate and reliable performer; buttons quick to respond to the user's touch and changes effected equally rapidly, the iA function getting it right and identifying the subject most of the time. Recomposing the shot if it doesn't and trying again usually provides the desired result. Maximum resolution, minimally compressed JPEGS are committed to memory in just under two seconds, which isn't bad at all, while individual RAW shots are written in a 'not bad' 3-4 seconds. Sitting alongside the on/off switch, the main shutter release button is encircled by a zoom slider, sporting, again, a raised ridge for better purchase, and, to the right of this again, another tiny, ridged button for the aforementioned 'E.Zoom'. While, as we've already established, the latter works well enough, the action of the zoom when used 'properly' is commendably smooth, steady and moreover quiet, sound-tracked by the very faintest of mechanical noises. Moving then to the Panasonic Lumix DMC-FX150's back plate, and, like the recently reviewed FX37 before it, we are presented with some distinctly plastic looking buttons that would be more at home in an Xmas cracker, which proves a disappointment. Nestling into the top right hand corner of the camera back we find a partially recessed thumb-operated mode dial featuring five distinct function settings. Starting with intelligent auto mode (iA) and moving clockwise we come to program mode, manual mode, followed by scene mode, and finally a motion picture/video mode. In both Program and Manual modes (but not iA), users can select RAW shooting alongside regular JPEG, or RAW + JPEG, as well as manually adjusting ISO sensitivity, here running from ISO 100 to ISO 1600. Aperture, shutter speed and exposure compensation can be further adjusted in manual mode courtesy of an on screen slider. Interestingly, the 24 hand holding scene modes include pin-hole and film grain settings, plus two baby modes and one for pets, alongside the regulars for optimally enhanced portraits and scenery. Each option is indicated by cartoon-ish icons, which shouldn't scare the uninitiated. Beneath the mode dial on the Panasonic Lumix DMC-FX150's back is a square of nine raised plastic nodules that provide a degree of purchase for the thumb when the camera is gripped in your right hand. There's not much to grip otherwise � the camera's surface being as smooth as its zoom action. Ranged alongside at the right is a slider control for flicking between image capture (denoted by the familiar camera icon) and playback (signified by the equally unambiguous green 'play' triangle). Though � as on the earlier FX37 � it's obvious what this switch is for, here users cannot immediately return to capture mode with a half press of the shutter button, unlike some pocket camera systems with a dedicated button for playback instead. This is a shame, as, should a picture opportunity present itself while the camera is still in review mode, it will very probably be lost. In the middle of the control layout we again find a four-way controller with four separate buttons instead of a pivoting pad, at the centre of which is the regular menu/set button. Used in the main to tab through onscreen menu items or images in playback, a press of the top button when in capture mode brings up an exposure compensation slider on screen with the ability to adjust between +/- 2EV. The button immediately beneath is for switching to the aforementioned macro mode for shooting subjects as close as 5cm (again the same as on the FX37), the button on the left for selecting self-timer modes, while the one to the right of the menu/OK button is for selecting flash mode options. In iA mode the user is merely confronted with the ability to turn auto flash on or off, while if turning the shooting mode dial to Program or Manual, a wider variety of five flash choices are offered, most coupled with red eye reduction. Press the centrally-located 'menu' button within capture mode and both shooting and set up folders appear onscreen, each option clearly spelt out. Within the record menu, users have the ability to alter aspect ratio from 4:3 to 3:2 or widescreen 16:9, access to the aforementioned ISO sensitivity plus colour effect modes including standard issue B&W, sepia, cool and warm settings. Using the picture adjustment option, contrast, sharpness, saturation and even noise reduction can be manually tweaked by virtue of a +/- sliding scale. Within the set up menu a live histogram can be called up on screen to check exposures before firing the shutter. Nothing revolutionary perhaps, but most of the boxes � and then some � are ticked for a compact in this price bracket. The final two buttons at the rear of the Panasonic Lumix DMC-FX150 are again identical to those found on the FX37; marked with the self explanatory 'display' and the less familiar 'Q.menu' � not a 'quality' menu as first might be assumed, but a 'quick menu' that summons up a drop-down toolbar running across the top of the LCD screen. As it indicates, this allows rapid access to the likes of white balance and resolution without having to otherwise navigate separate menu folders, a bit like the dedicated 'F' mode found in Fuji compacts, but more expansive. Moving from the Panasonic Lumix DMC-FX150's back over to its left hand flank we find no features at all, while the right side has a flick-open plastic flap protecting three ports. From the top these are a component out socket, a USB/AV out socket for attaching the camera to your computer or PictBridge enabled printer or TV set via conventional AV cable, and thirdly a DC-in socket for using the camera with an optional AC mains adaptor. Above this compartment is an eyelet for attaching the provided wrist strap. Again these features mirror exactly those found on the FX37. Examining the FX150's base plate we find a screw thread for fixing the camera to a tripod, alongside which is a lockable compartment that houses both rechargeable lithium ion battery and removable (again optional) SD or SDHC memory card. The FX150's rechargeable lithium ion battery is good for up to 330 shots from a single charge; neither exceptional nor below par, such a feat is in truth pretty average. A 50MB internal memory cache also gets you started straight out of the box. As we said at the beginning, the above is rather more than you'd expect to find on board a pocket compact in this price bracket, and, for the most part the camera is easier to use than a model with a similar level of spec � let's call it a bridge camera � would usually be. Thus the Panasonic Lumix DMC-FX150 presents itself as a model suitable for beginners that he more experienced wouldn't tire of easily. At the end of the day though, looks and performance aside it's picture quality that's the most important aspect of any digital camera. So how does the Panasonic Lumix DMC-FX150's image quality measure up? PhotographyBLOG is a member of the DIWA organisation. Our test results for the Panasonic Lumix DMC-FX150 have been submitted to DIWA for comparison with test results for different samples of the same camera model supplied by other DIWA member sites.